MINNEAPOLIS, Jan. 30, 2018 /PRNewswire-USNewswire/ -- Mike Haynes was known for impressive stats during his illustrious 14-year, Hall of Fame career in the NFL. His nine Pro Bowls, 46 interceptions and two career touchdowns led many to consider him the greatest cornerback ever. But in 2008, came the most important stat of all for Mike - elevated levels of Prostate Specific Antigen (PSA) in a blood test that led doctors to discover he had prostate cancer. As an initiative to encourage all men to know their prostate cancer risk and to talk to their doctor about whether prostate cancer screening is right for them, the NFL has teamed with the Urology Care Foundation—the official foundation of the American Urological Association— for the ninth consecutive year on the Know Your Stats About Prostate Cancer® campaign. 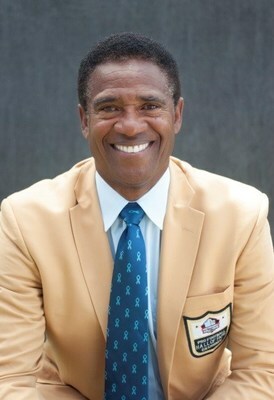 The campaign is led by some of our favorite heroes of football, like Pro Football Hall of Famer and prostate cancer survivor, Mike Haynes. As a spokesperson for the campaign, Mike raises awareness of prostate cancer across the country, and leading up to Super Bowl LII, he will be sharing with NFL fans, his story of how prostate cancer caught him "off guard." The stakes are high. About one in nine men will be diagnosed with prostate cancer, but the odds increase to one in six if they are African American and one in five if they have a family history. Prostate cancer is also the second leading cause of cancer-related death among men, and there are often no symptoms. Luckily, the five-year survival rate is nearly 100 percent for people who detect and treat the disease early. With the Super Bowl just around the corner, don't sit on the sidelines, join Haynes on Wednesday, January 31 and Thursday, February 1 in this campaign to save lives. NOTE TO REPORTERS: To arrange an interview with Mike Haynes, please contact Christine Frey at 443.909.0839 or cfrey@AUAnet.org. Approximately 165,000 men will be told they have prostate cancer this year. One in nine men will develop prostate cancer. One in six African American men will develop prostate cancer. One in five men with a family history will develop prostate cancer. This year the New England Patriots and New Orleans Saints will work in collaboration with local cancer support organizations and the Urology Care Foundation to help raise prostate cancer awareness. The Urology Care Foundation recognizes the choice to be screened for prostate cancer is a personal one. Before you decide to be tested, talk to your doctor about your risk for prostate cancer, including your personal and family history. Then talk about the benefits and risks of testing. About Michael Haynes: Michael is a former National Football League cornerback who played for the New England Patriots and the Los Angeles Raiders. His professional football career began when he was selected in the 1976 NFL Draft by the New England Patriots. He was then elected to the Pro Football Hall of Fame in 1997. Haynes, a prostate cancer survivor, is the spokesperson for the Know Your Stats® campaign and speaks on their behalf to educate and encourage men to be proactive about their prostate health. About the Urology Care Foundation: The Urology Care Foundation is the official foundation of the American Urological Association (AUA). The Urology Care Foundation is committed to advancing urology research and education. We work with researchers, health care professionals, patients, and caregivers to improve patients' lives. About the AUA: Founded in 1902, and headquartered near Baltimore, Maryland, the American Urological Association is a leading advocate for the specialty of urology, and has more than 21,000 members throughout the world. The AUA is a premier urologic association, providing invaluable support to the urologic community as it pursues its mission of fostering the highest standards of urologic care through education, research and the formulation of health policy. About the NFL Player Care Foundation: The NFL Player Care Foundation (PCF) is an independent organization dedicated to helping retired players improve their quality of life. PCF addresses all aspects of life by providing programs and assistance with medical, emotional, financial, social and community issues.